You would think that having spent over 4 months and 5000 km (5,000 km baby! YEAH!) 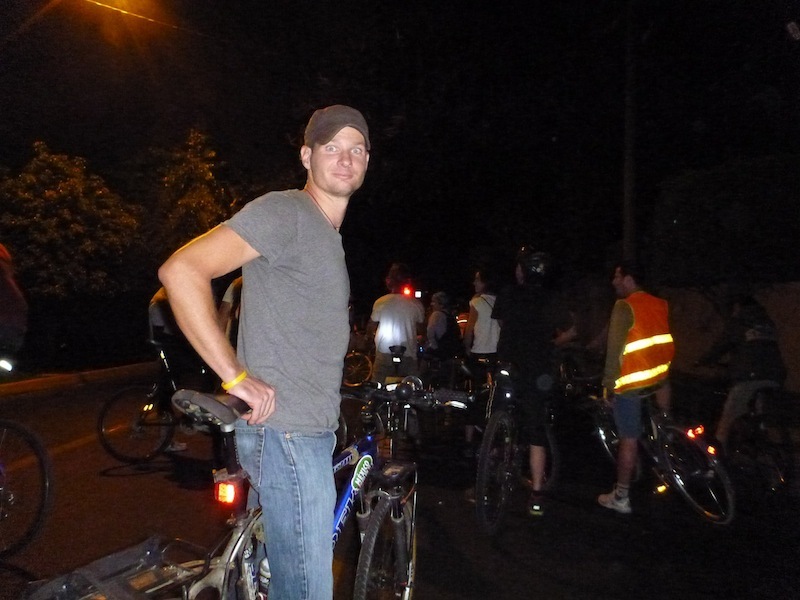 on a bicycle tour that I would have begun to develop some sort of affinity with the recreational cyclist. You would think, that when I get passed by a peloton of guys in form-fitting clothing, riding $2000 bikes and being chased by support cars, that my instinctual reaction would be to honk Tony’s horn and cheer them on. Quite the opposite actually. Instead, I feel nothing but disgust for a sport that seems to require that a weekend amateur dish out more money than I spent on my last car so that he can look like a clown on his way to mardi-gras. I see them spinning by and I wonder about the human urge to buy pretty shiny things. Also though, I feel that this tendency for “cyclists” to spend money on gear they don’t need hurts the sport for two reasons: 1) There is nothing visual to distinguish the casual rider from the aspiring professional and this causes angst and damages the morale of the poor-but-competitive rider lining up their second-hand frame at the starting line next to an old git on a $6000 racer. 2) When you see a “cyclist” riding by on the street you have no way of telling how serious you should take him/her. Cars have no reference for how much respect (read: space) they should give him/her. 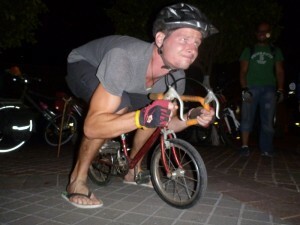 Is he Lance Armstrong? Or is he having a mid-life crisis and can’t afford the porsche? The result being that aspiring professionals and professionals are more likely to get hit by a car (because they spend more hours on the road , and get the same respect as an amateur). Fat “cyclists” should not be allowed to wear form fitting clothing. EVER. Seriously people, if you’ve got a belly hanging out, you want to be burning more calories not making your globular beer reservoir more aerodynamic! On the other end of the spectrum, I do feel an affinity for the mexican farmer on his way to work on a rusty hunk of metal with two wheels. Perhaps it is because I spent the last 4 months hauling Tony’s arse up hills wearing a simple bluey (AKA: singlet, AKA: tank top) that I respect the unassuming nondescript city commuter making his/her daily trek to work on a bicycle bought and fitted out for it’s utility as opposed to its erm… compensation factor. 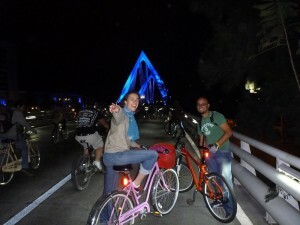 In Guadalajara there is a fantastic bike culture and great community supporting the bicycle as a means of transport. 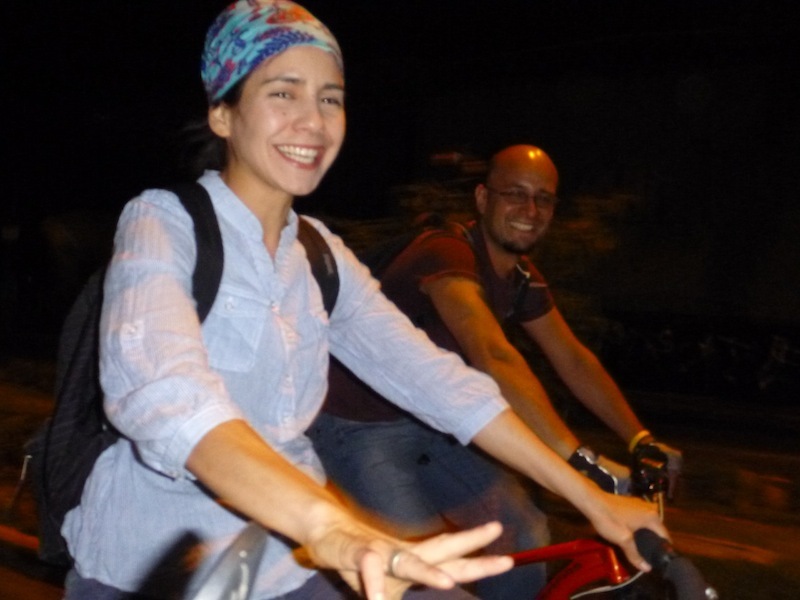 More than that though, the community also promotes the bicycle as fun and takes us all back to those childhood days when we had our first jalopy. For us as children – along with the sheer joy of riding – the bicycle gave us our first ticket to freedom and independence, and for me, participating in the activities of the Guadalajara cycling community brought back that childhood excitement. It is an active community. There was the Bicifest – a festival promoting all things bikes. 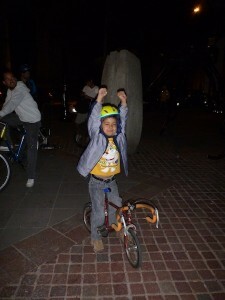 There was the ¡¡¡Provedencia, Adopta un Bache!!! Day – during which people adopt a pothole and paint flowers or other objects around them as a way of protest. Then, every sunday from 7am to 2pm the main thoroughfares in Guadalajara are closed to cars and thousands of people take to the streets to just enjoy a bit of fresh air, exercise, and the atmosphere of a city on two wheels. Then there were the paseos. 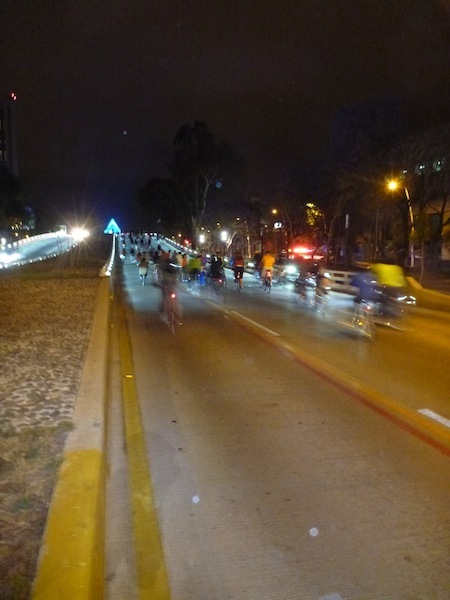 The paseos were organised rides, usually at night, with anywhere from a few hundred to a few thousand cyclists taking over the streets and going on a 15-20km ride around the city. Now, if thousands of amateur helmet-less cyclists taking over the cities streets and highways and running red lights while riding unreliable bicycles in the dark, doesn’t sound safe to you… then you are absolutely right, it isn’t. BUT SO WHAT IT’S FUN! It is exactly this partial sense of reckless abandonment that gives these paseos that sense of childlike joy and freedom. The last paseo I took part in, I estimated there were over 2,200 riders from all-sorts. There were kids, there were parents, there were cruisers, there were BMXs, there were girls in jeans and high-heels and guys in shorts and flip-flops, there were expensive mountain bikes and there were old road warriors falling apart. There were even guys with speakers blaring music. Everyone was welcome and there are no rules. It was a huge amount of fun as we charged through red lights honking our horns, ringing our bells, whistling and shouting – generally making as much noise and chaos as we could. It is hard to describe, but there is something about flying through a highway tunnel at night surrounded by strangers and a few friends, that makes you feel like you have become a part of the city. There is something about it that makes you feel alive. Seriously Awesome! Quite incredible to see…looks like a blast. You take care of yourself. Love to read your blog, etc. I forgot to mention I really appreciated knowing about international communications these days. Seems complicated but I am sure if I did it a few times it would not be. Thanks – it updated my knowledge for sure since I haven’t travelled a lot…yet! !